Manipulation of the patient’s own immune system to target cancer has for the first time demonstrated significant clinical efficacy against metastatic melanoma, renal cell cancer and non-small cell lung cancer. Cancer immunotherapy will play a pivotal role in improving outcomes for patients with lung cancer. In order to improve the activity of cancer immunotherapy in a higher proportion of patients, a multifaceted approach, targeting not only the cancer cell but also the tumour microenvironment and the immune system, is likely to be essential to favour complete tumour eradication, alongside conventional approaches. The Centre will draw on the expertise of both institutions to incorporate these components in a rational and multidisciplinary bench to bedside approach. 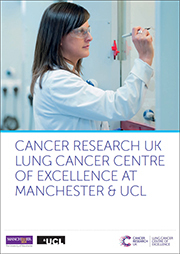 UCL is currently leading efforts to determine heterogeneity and the potential impact of intra-tumour heterogeneity in the clinical outcome of lung cancer patients. In this scenario, the immune system is likely to play an essential role, as the same genetic instability that promotes tumour progression might also generate neo-antigens seen by the immune system as non-self, thus becoming potential targets of activated immune cells. Several research teams are bringing together the cancer and immune biology fields by investigating the interplay between the immune system and intra-tumour heterogeneity and the relevance of different immune-modulatory pathways in the control of anti-tumour immunity in human lung cancer. In a parallel and complementary area of discovery, Manchester has developed a number of tumour models to investigate the impact of radiotherapy and immunotherapy combination approaches. Complementary to this, at UCL new ways to promote tumour apoptosis are being studied. Finally, we are using expertise in cellular therapies to develop preclinical and clinical protocols for the genetic engineering of immune cells, arming them with the necessary tools to recognise the tumour and to function within an immunosuppressive microenvironment. Tumour cell death induced by different agents will help reduce disease burden whilst also acting as a personalised vaccine, allowing recognition of multiple tumour antigens and neo-antigens by the immune system. In this context, incorporation of immune modulatory strategies capable of enhancing immunity should result in a long lasting, diversified and evolving layer of protection against lung cancer. We will engage in a collaborative effort to use relevant mouse models of cancer to determine the best combinatorial approaches incorporating the activity of drugs inducing immunogenic cell death with immune modulatory antibodies. The impact of such therapies will be tested in preclinical models of lung cancer alone and in combination with chemo, radio and immune modulatory agents in order to inform future design and implementation of clinical trials harnessing the immune response. Through a multidisciplinary approach incorporating preclinical and clinical research, we will establish a strong, continually growing and successful translational cancer immunology programme for the treatment of lung cancer. Leader of the Targeted Therapy group in the Institute of Cancer Sciences at The University of Manchester and Consultant at The Christie NHS Foundation Trust. Leader of the Cancer Immunology Unit at the UCL Cancer Institute.